Mitochondrial DNA (mtDNA) haplogroups and single nucleotide polymorphisms (mtSNP) have been shown to play a role in various human conditions including aging and some neurodegenerative diseases, metabolic diseases and cancer. To investigate whether mtDNA haplogroups contribute to the occurrence of cancer in a specific Chinese population, we have carried out a comprehensive case-control study of mtDNA from large cohorts of patients with three common cancer types, namely, colorectal cancer (n = 108), thyroid cancer (n = 100) and breast cancer (n = 104), in Wenzhou, a southern Chinese city in the Zhejiang Province. We found that patients with mtDNA haplogroup M exhibited an increased risk of breast cancer occurrence [OR = 1.77; 95% CI (1.03-3.07); P = 0.040], and that this risk was even more pronounced in a sub-haplogroup of M, D5 [OR = 3.11; 95%CI (1.07-9.06); p = 0.030]. In spite of this, in patients with breast cancer, haplogroup M was decreased in the metastatic group. On the other hand, our results also showed that haplogroup D4a was associated with an increased risk of thyroid cancer [OR = 3.00; 95%CI (1.09-8.29); p = 0.028]. However, no significant correlation has been detected between any mtDNA haplogroups and colorectal cancer occurrence. Our investigation indicates that mitochondrial haplogroups could have a tissue-specific, population-specific and stage-specific role in modulating cancer development. Mitochondria, known as the cellular power plants, also regulate cell death and cell proliferation. Mitochondria are under dual genome control. Human mtDNA encodes 13 essential subunits of the oxidative phosphorylation (OXPHOS) system as well as 2 rRNAs and 22 tRNAs used in mitochondrial translation. Alterations in mtDNA including both mutations and polymorphisms have the potential of changing the capacity of mitochondrial function. In particular, changes in oxidative phosphorylation resulting from mitochondrial dysfunction have long been hypothesized to be involved in tumorigenesis. To explain the fact that cancer cells were high in fermentation and low in respiration, Warburg proposed that cancer originated from a non-neoplastic cell which adopted anaerobic metabolism as a means of survival after injury to its respiratory system, which led to the notion that tumors were initiated by persistent damage to the mitochondria[3, 4]. Supporting such idea, changes in the number, shape, and function of mitochondria have been reported in various cancers . Interestingly, abnormal mtDNA was observed in leukemic myeloid cells using an electron microscope[6, 7] long before DNA sequencing technology was available. Subsequently, mutations in both the non-coding and coding regions of the mtDNA have been identified in various types of cancer [8–10]. mtDNA is predominantly maternally inherited, and largely lacks recombination. A human mtDNA haplogroup is defined by unique sets of mtDNA polymorphisms, reflecting mutations accumulated by a discrete maternal lineage. The haplogroups are associated with region-specific mtDNA sequence variation as a result of genetic drift and/or adaptive selection for an environment-favored mitochondrial function[13, 14]. Difference in redox signaling as a consequence of haplogroup-associated oxidative phosphorylation capacity has been suggested as the molecular mechanism involved in the haplogroups-associated phenotypes[15, 16]. The haplogroup association studies have been used to investigate the effect of mtDNA variants on various complex conditions such as aging[17, 18], metabolic diseases[19, 20], neurodegenerative diseases [21, 22], infectious diseases [23, 24] and cancer[3, 8, 9]. In particular, haplogroups D4a, D5 and D4b2b were reported to be increased in centenarians in Japanese [25, 26], while D4 was found to be enriched in female and N9 and M9 decreased in a Chinese population in Rugao area. mtSNP at 10398, which is a major diagnostic site for macro-haplogroups M and N in Chinese population[27, 28], has been implicated in longevity, Parkinson's disease, and breast cancer in various populations in some seemingly conflicting reports[31–34]. Interestingly, while reported as enriched in group exhibits longevity, D4a and D5a were observed to increase susceptibility in a Chinese population to esophageal carcinoma. To assess the possible contribution of mtDNA haplogroup-specific polymorphisms to the prevalence of cancer in a southern Chinese population, we performed a case-control study of patients with three of the local most common types of cancer, breast cancer, thyroid cancer and colorectal cancer in Wenzhou, Zhejiang Province of China. The number and age information (in years) for the cancer patients used in this study: 108 colorectal cancer patients (mean ± SD 62.98 ± 12.63, median = 64, range 30-88), 104 breast cancer patients (mean ± SD 51.6 ± 10.29, median = 51, range 27-79) and 100 thyroid cancer patients (mean ± SD 45.98 ± 12.59, median = 46, range 20-84). The patients were recruited when they were admitted for surgery at the First Affiliated Hospital of Wenzhou Medical College from May, 2007 to November, 2008. Histological confirmations of each cancer type were carried out immediately following each surgery. Three sets of age, gender and geographically matched control subjects who had a cancer-free history, and had no other known diseases which could be associated with mitochondrial defects were also recruited at the Physical Examination Center of the same hospital from October, 2008 to December, 2008. The numbers and ages (in years) of controls for each study are as follows: n = 124 (mean ± SD 60.15 ± 9.3, median = 60, range 37-84) for the colorectal cancer study, n = 114 (mean ± SD 53.44 ± 11.66, median = 52, range 27-84) for the breast cancer study, and n = 138 (mean ± SD 47.96 ± 6.64, median = 49, range 27-62) for the thyroid cancer study. Informed consents were obtained from all patients and controls according to the regulations set forth by the ethical committee of Wenzhou Medical College. About 2 ml venous blood was collected from each sample before surgery and any drug treatment. Total DNA was extracted using a standard phenol-chloroform method as described previously. The sequences of two pairs of primers designed to amplify the mtDNA D-loop and ND3+tRNAarg+ND4L region were as follows, L15792F: TCATTGGACAAGTAGCATCC, H794R: AGGCTAAGCGTTTTGAGCTG and L9967F: TCTCCATCTATTGATGAGGGTCT, H10858R: AATTAGGCTGTGGGTGGTTG. PCR was performed on a Thermal Cycler 170-9703 PCR machine (BIO-RAD, USA). The PCR conditions were as follows: pre-denaturation at 95°C for 5 min, then 35 cycles of [94°C for 30 s, 57°C for 35 s, 72°C for 1 min], and a final extention at 72°C for 4 min. The PCR products were purified using the Agarose Gel DNA Fragment Recovery Kit Ver.2.0 (TaKaRa, Japan) and subsequently sequenced on an ABI Prism 3730 sequence analyzer. To assign a mtDNA haplogroup to each sample, all sequences were compared with the revised Cambridge Reference Sequence (rCRS) and aligned using the CodonCode Aligner 3.0.1 (CodonCode Corporation, USA) software program. Based on the most recent refined East Asian mitochondrial haplogroup tree [27, 28, 39], the initial assignment was performed with the sequencing information from the D-loop, ND3 and ND4L regions. When necessary, additional information was obtained by restriction fragment length polymorphism (RFLP) analysis at sites: 663 (HaeIII), 3394 (HaeIII), 4833 (HhaI), 5178 (AluI) and 9824 (HinfI). With some samples, the 9 bp deletion at the COII-tRNAlys junction was also detected to further identification. All statistical analyses were performed using SPSS software (version 13.0) (SPSS Inc., Chicago, IL, USA). The Pearson chi-square test was used to analyze the relationship between the prevalence of haplogroups and different cancer features. Binary logistic regression analysis was also carried out to determine the contributions of haplogroup and other risk factors to cancer features. Macro-haplogroups M and N are major descendents of L3, a superhaplogroup and an "African Eve" which shapes all various sub-lineages out of Africa[12, 40]. 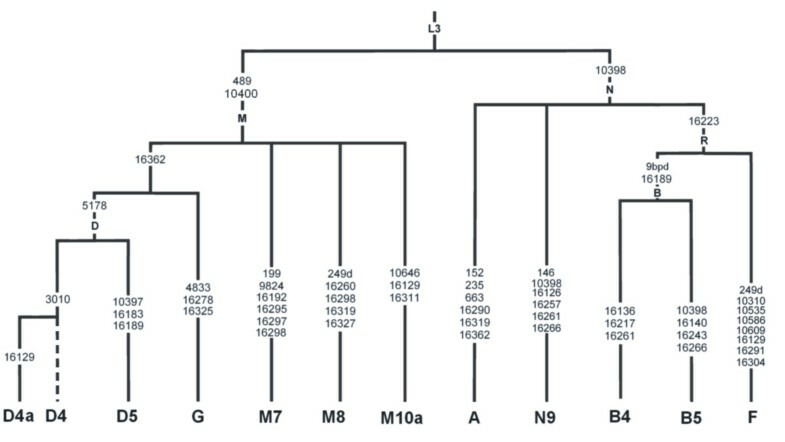 These specific haplogroups could be identified by the polymorphisms at positions 10400 and 10398 in the Chinese Han population, where M is defined by T at 10400 and likely exhibits G at 10398 whereas N has A at 10398 as in the Cambridge Standard sequence (Figure.1). It was reported that haplogroup N was associated with an increased risk of breast cancer in the Indian population. Interestingly, 10398A in African-American and 10398G in European-American populations were both reported to correlate with increased breast cancer risks. In a case-control study (CCS) conducted with breast cancer patients in a southern Chinese population, we tested the correlation between macro-haplogroups M and N and breast cancer incidence. We found that haplogroup M posed a significant risk for breast cancer (OR = 1.77; 95%CI 1.03-3.07; P = 0.040), whereas haplogroup N was associated with a decreased incidence (OR = 0.56; 95%CI 0.33-0.98; P = 0.040) (Table 1). Following age-adjustment of the data in a binary logistic regression analysis, the results became even more significant. Haplogroup M had a higher occurrence in breast cancer patients (OR = 1.84; 95%CI 1.07-3.20; P = 0.029), whereas haplogroup N was decreased in frequency (OR = 0.54; 95%CI 0.31-0.94; P = 0.029). We then examined the mtSNP at position 10398, and found that 10398G was correlated with an increased incidence of breast cancer (OR = 1.77; 95%CI 1.00-3.14; P = 0.050), and 10398A showed a protection effect (OR = 0.56; 95%CI 0.32-1.00; P = 0.050) (Table 1). A stronger influence was revealed after a binary logistic regression analysis for the age-adjustment for both 10398G (OR = 1.98; 95%CI 1.11-3.53, P = 0.021) and 10398A (OR = 0.51, 95%CI 0.28-0.90, P = 0.021). P values were estimated by "chi-square test"; (*) indicated statistical significant (P < 0.05). OR indicates odds ratio; 95% CI, 95%confidence interval. We also analyzed some clinical characteristics and other risk factors for breast cancer in the breast cancer patients divided among macro-haplogroups M and N. As shown in Table 2, age is not a contributing factor (P = 0.838) to the differences we observed in breast cancer patients with macro-haplogroups M and N. Similarly, we did not detect a significant difference in Body Mass Index (BMI) between these patients. Further investigation of the expression of progesterone receptor (PR) and estrogen receptor (ER) failed to reveal any difference between the M and N haplogroups. However, surprisingly we found an enriched presentation of the N haplogroup in patients with metastatic breast cancer (P = 0.044). After adjusting with co-variants like age, BMI, PR and ER expression, N still exhibited a significantly higher occurrence in the metastatic group (OR = 0.39; 95%CI 0.17-0.94; P = 0.036). P values were estimated by "chi-square test"; (*) indicated statistical significant (P < 0.05). BMI, body mass index; BMI ranging18-25 is considered as normal. We furthered our investigation by performing a more detailed sub-haplogroup analysis. As described in the Materials and Methods section, based on the mtSNPs shown in Figure 1, we were able to assign 104 breast cancer patients and 114 controls to 12 sub-haplogroups. As shown in Table 3, we found haplogroup D5, a sub-haplogroup of D under M (Figure. 1), displayed a significantly higher frequency in breast cancer patients compared with control subjects (OR = 3.11; 95%CI 1.07-9.06; P = 0.030). This significant correlation remained after age-adjustment of the data in binary logistic regression analysis (OR = 3.13; 95%CI: 1.07-9.13; P = 0.037). 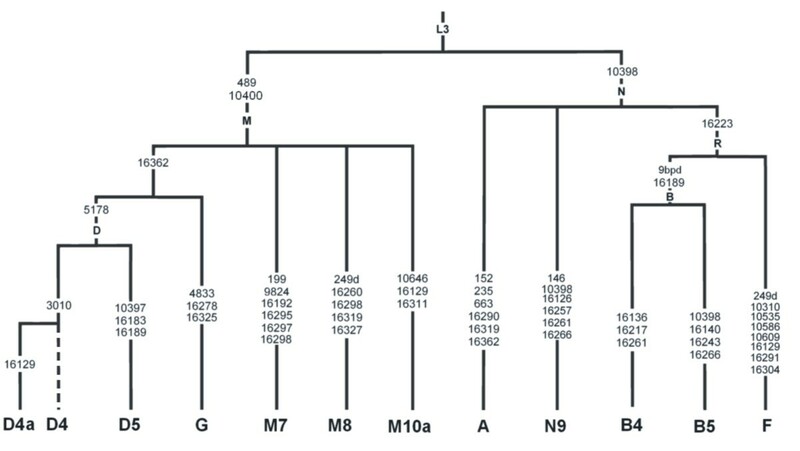 Classification of 12 mtDNA haplogroups in subjects of three case-control studies. The defining sites (as compared with the revised CRS) utilized in this study are listed in the branches. "d" indicates a deletion; "9 bpd" indicates a 9 bp deletion in the intergenic mtDNA region between nucleotides 8195-8316. To determine if the coincidence of a specific mtDNA haplogroup with breast cancer indicates a general role in tumorigenesis in the southern Chinese population, we extended our studies to two other common cancer types in the Wenzhou area, colorectal cancer and thyroid cancer. Similar case-control studies were conducted on colorectal cancer and thyroid cancer patients. As shown in Table 3, unlike what we observed for breast cancer, there was no correlation between haplogroups M, N or D5 and occurrences of these cancers. However, our results revealed that haplogroup D4a, a sub-haplogroup of D4, which shares the same ancestry of D and M with D5 (Figure. 1), had a significantly higher frequency in thyroid cancer patients relative to control subjects (OR = 3.00; 95%CI 1.087-8.29; P = 0.028). After adjusting the data for age and gender in binary logistic regression analysis, the observed difference between cases and controls remained significant (OR = 3.18; 95%CI 1.11-9.11; P = 0.031). Nevertheless, no significant correlation has been detected between any mtDNA haplogroups and colorectal cancer occurrence (Table 3). To determine the incidence of individual mtSNPs within haplogroups D4a and D5 in breast or thyroid cancer patient samples, we performed a stepwise investigation of the formation of the D5 and D4a sub-haplogroups and examined their potential correlation with cancer occurrences. As shown in Table 4, the combination of 10400T and 489C, which mostly determined macro-haplogroup M in the Chinese Han population, was associated with an increased breast cancer incidence. An additional 16362C, which mostly further defined the D plus G haplogroups, somehow negated such a correlation, whereas 10397G, which helped to determine D5, restored the observed association with an increased risk of breast cancer. Individually, only 10398G (people with 10397G all belong to this group) exhibited an increased frequency in breast cancer patients relative to control subjects. For thyroid cancer, the combination of 16362C and 16129A, both in the highly variable area of the D-loop region, exhibited a significant correlation with cancer incidence. P values were estimated by "chi-square test"; (*) indicated statistical significant (P < 0.05). OR indicates odds ratio; 95% CI, 95% confidence interval. In addition, all of the mtSNPs in the D-loop region, which were not utilized to determine the haplogroups and identified with a frequency of more than 5% in this study, were also analyzed. As shown in Table 5, none of them displayed significant association with the occurrence of either of the cancer types. In this study, a total of 312 cancer patients (104 with breast cancer, 108 with colorectal cancer and 100 with thyroid cancer) and their matched control subjects were analyzed for the mitochondrial haplogroups and some related mtSNPs. In the Wenzhou area, breast cancer ranks number one in cancer occurrence among females, as in the other regions of the world. Thyroid cancer ranks number one in the age group of 15-34, and colon cancer tops liver, lung and stomach cancers, in cancer patients under 15 years old, both indicating a genetic predisposition. An age and regional matched study increased our chances of discovering a contribution from mtDNA. The first finding of our study is that macro-haplogroup M has an increased frequency in breast cancer patients relative to controls, and intriguingly, breast cancer patients in macro-haplogroup N are more likely to exhibit metastatic tumors. Previously, a similar CCS with 124 sporadic breast cancer patients and 273 controls, together with analysis of 2334 individuals belonging to 18 regions in India, led to the proposition that mtSNP 10398A imparted haplogroup N with an increased risk for breast cancer. A10398G is probably one of the best studied mtSNPs, in particular with respect to its potential effect on tumorigenesis. Noticeably, A10398G changes a threonine residue (A allele) to an alanine (G allele) at the C-terminus of the ND3 subunit of respiratory complex I. Using the cybrids system, it was reported that the closely linked 8701A/10398A mtSNPs were associated with a lowered mitochondrial matrix pH, and at the same time an increased basal level of mitochondrial calcium and cytosolic calcium response to histamine. A series of epidemiological investigations of neurodegenerative diseases like Parkinson's disease, Alzheimer's disease, and amyotropic lateral sclerosis (ALS) suggested that the 10398A allele is associated with the degenerative phenotype. In a large population-based CCS with 654 cases and 605 controls, African-American women with the 10398A allele were shown to have a significant risk of invasive breast cancer, but such a correlation was not observed in white women. In a separate CCS with 156 unrelated European-American women with familial breast cancer and 260 controls, 10398G was associated with an increased risk of breast cancer. An independent investigation carried out with a Polish breast cancer population also suggested 10398G as an inherited predisposition factor for the development of breast cancer. However, other studies of either African-American females or Spain and Canary Islands women failed to confirm a role for mtSNP at 10398 in breast cancer development. Nevertheless, 10398G was found as a risk factor in oral cancer among Indian smokers. To reconcile these seemingly conflicting results, based on our own data, we proposed that the combination of certain mtDNA haplogroups or mtSNPs (in this case, 10398A or G) with other nuclear encoded factors (some potentially tissue-specific), could play a role in tumorigenesis. The net result could be either alteration of calcium or redox signaling. It is also important to note that the enhanced generation of reactive oxygen species (ROS), which has been suggested by several investigators as a likely underlying mechanism by which mitochondrial haplogroups and mtSNPs play a role in cancer development[8, 25, 31, 34], could both activate an oncogenic pathway which would lead to being a risk factor for cancer occurrence, or activate the apoptotic reaction, which could display a protective effect in the late stages of cancer development. Other determining factors in this process include the cellular thresholds required to activate those pathways, which also could be tissue-specific. Another major finding of our studies is that mtDNA haplogroups D4a and D5 were associated with an increased risk of breast cancer and thyroid cancer, respectively, in the southern Chinese population. In a previous investigation on longevity in a Japanese population, D4a and D5 were found to be enriched in centenarians. It was further hypothesized that the replacement of Ile78Thr in the cytochrome b subunit of respiratory complex III in D4a, and Ile278Val in ND2 and Ile423Val in ND4 of complex I in D5 could play roles in modulating ROS production[25, 26]. It is worth noting that aging and cancer could both result from the deregulation of cell homeostasis. The regulation of homeostasis is mostly achieved by the balanced control of cell death and cell proliferation. Thus it is possible that the long lifespan observed to be associated with D4a and D5 could be achieved at the expense of higher cancer incidence. Consistent with this notion, it was reported that D5a and D4a are risk factors of esophageal cancer in the Chaoshan and Taihang Mountain areas of southern China. In fact, most patients and control subjects identified as D5 in our study are indeed D5a, as most of the D5 sub-haplogroup individuals in southern China could be further designated as D5a. In another study, haplogroup D was suggested as a likely risk factor for endometrial cancer in southwestern China. In addition to 10398 variants, the functional implications of the haplopgroup J defining mtSNP C295T in the D-loop region were also examined. It was reported that C295T was associated with an increased binding of TFAM (transcription factor A, mitochondrial), and as a result, cybrids with haplogroup J had a significantly increased mtDNA copy number compared with those carrying haplogroup H. It is possible that the combination of 16362C and 16129A in the D-loop region observed in our study could have an effect on mtDNA replication and/or transcription as well. Furthermore, a major finding of our study suggested that mitochondrial macro-haplogroup M or mtSNP 10398G could exert different effects under different nuclear background. This is consistent with results of our previous study in which we found that mtDNA mutations, probably mediated by ROS and apoptosis, can play different roles in different stages of cancer development. The potential regulation of tumorigenesis by mtDNA haplogroups or mtSNPs is likely facilitated by nuclear encoded factors, as evidenced by the tissue-specific and population-specific features of mtDNA haplogroups. To test this hypothesis, it would be necessary to extend our investigation to include a greater diversity of populations and cancer types, and more importantly complementary functional assays. Finally, based on results obtained from this study, an extended investigation including larger cohort and with more cancer types would be warranted to reveal further the interaction between mitochondrial and nuclear genome in cancer cells. We found macro-haplogroup M and its sub-haplogroup D5 exhibited an increased risk of breast cancer occurrence but haplogroup M was decreased in the metastatic group. On the other hand, haplogroup D4a was associated with an increased risk of thyroid cancer, while no significant correlation has been detected between any mtDNA haplogroups and colorectal cancer occurrence. Our data indicate that mitochondrial haplogroups could have a tissue-specific, population-specific and stage-specific role in modulating cancer development. This work is supported by Zhejiang provincial top key discipline of laboratory medicine, Zhejiang provincial program for the cultivation of high level innovative health talents, and National Science Foundation of China (No. 30800620). Yidong Bai is supported by a NIH grant (R01 AG025223).